Thank you Tara and Audra for the wonderful homebirth of Taku! We are so happy that we could share our joy of his birth with you. It was such a wonderful experience to get to know each other through prenatal visits, labor and birth, and postpartum visits. I can say that home birth was a right choice for our family. Taku's brothers and father were so happy to be together with him at home right after the birth. Thank you again for your support and warm smiles. I feel so totally lucky to have had the kind of birth that I wanted that seemed surprisingly easy to handle. It was painful there at the end, but not unreasonably so and didn’t go on for too long. I got to stay at home, and I never had to deal with things I didn’t want to. Tara and Audra were important in making this happen for me throughout my pregnancy and birth. I will be forever grateful for both of my midwives, Audra and Tara. I feel that being a midwife – and especially a home birth midwife – is a balancing act. It seems that a midwife must balance her belief that birth is a completely natural process with her responsibility of being the medical caregiver of a woman and her child. Both Audra and Tara balanced the roles perfectly. They let me labor in whatever position my body was up for, and were incredibly encouraging throughout it. However, when it became apparent that little Eli would need some help to enter this world safely, they were quick to help make that happen, while at the same time respecting my body and reassuring my mind. This type of care continued immediately after the birth as they had to focus more on me and my body losing more blood than desired. Looking back, I am amazed at their ability to remain calm in moments that were certainly stressful. Their amazing care throughout pregnancy, labor, and delivery only continues during the postpartum period. I have no doubt that they genuinely care for me, my son, and our whole family. It’s that personal care that makes them more than just the people who helped me deliver my child. They were the first people to ensure that Elijah’s first experience of the world was a positive one. I am astoundingly grateful to have had the privilege to receive doula support from Tara and Susanna for the birth of my son. From the beginning, when I was in early labor Tara was in touch over the phone, then stopped by for a brief visit offering some comfort measures, and emotional support. As soon as my water broke and contractions seemed stronger, Tara was at my house and drove myself and my sister to the hospital; as a single mom this was incredibly nurturing and reassuring to me. Once we arrived at the hospital Susanna met us there, having just stepped off the plane from a friends wedding. Without a break she jumped into action. Susanna was present with me, supported me during my labor in the birthing tub, she brought her lightness and sense of humor and was creative with her interventions when my labor slowed. My labor lasted three days, and Susanna and Tara worked as a seamless team picking up where the other one left off. They were deeply supportive emotionally and physically. I felt super safe with both of them. I felt comfortable to be myself and follow my own instincts, and I trusted their support when it was time for me to make difficult decisions. When an intervention was offered, I could think it through with them, was it the right time? the right intervention? what were the pros and cons? They were completely present through the very end and beyond. Little did I know but Tara was taking notes and right before our postpartum visit Tara emailed me minute by minute notes from the labor that I was then able to reference when documenting my son's birth story. Also, Susanna followed up with specific recommendations for pelvic floor therapists. I could not have felt in better hands, and I could not recommend this doula team highly enough. For my previous two births, I prided myself in choosing an OB affiliated with a large Boston teaching hospital. And when there were placental complications (one major) during both deliveries, I was convinced at how “lucky” I was to be in that large teaching hospital with that experienced OB. It wasn’t until I was entering the third trimester of my third pregnancy that I came to my senses and realized that the complications I experienced in my previous deliveries were a direct result of the unnecessary inductions and medical interventions of OB-orchestrated, medicalized births. After much researching and soul-searching, I realized that my body could birth a baby without incident if I just let nature do what it was meant to do. I was very lucky to meet Audra Karp randomly at a toddler playgroup prior to my “epiphany” about the potential dangers of medicalized hospital births. As the weeks passed into my third trimester and I finally arrived at my decision for a natural homebirth, I was thrilled to have Audra as my midwife. Her knowledge, reassurance, and calm demeanor were the key qualities that led to my amazing homebirth. At 41 weeks, I happily went into labor on my own and my contractions quickly progressed from 10 minutes to 3 minutes apart. Audra, her student midwife, Catherine, and Audra’s partner midwife, Tara Kenny, arrived in the middle of the night and prepared their supplies while I labored in my living room. The early part of labor was much more tolerable than I anticipated. Having had two prior inductions with early epidurals, I was apprehensive about what real labor would feel like. Fortunately, it was nothing like Pitocin contractions and it was so nice to be able to walk freely through my home and labor as I needed to. As the contractions grew stronger, I gravitated more toward the bedroom where the midwives were located. I had no desire or need for a shower or bath but as the labor intensified and I got close to pushing, I was thrilled to use Audra’s birthing stool. At labor’s peak, I remember thinking, “someone please help me!” And when it became clear to me that I was the only one who could help me, I pushed the baby out! I had a slight hemorrhage after the baby was born, which Audra quickly stopped with a Pitocin injection. The placenta was ready to be delivered, but I think given my previous hospital-birth baggage, I subconsciously couldn’t push it out until after awhile Audra reassured me that the placenta was detached and everything was fine. 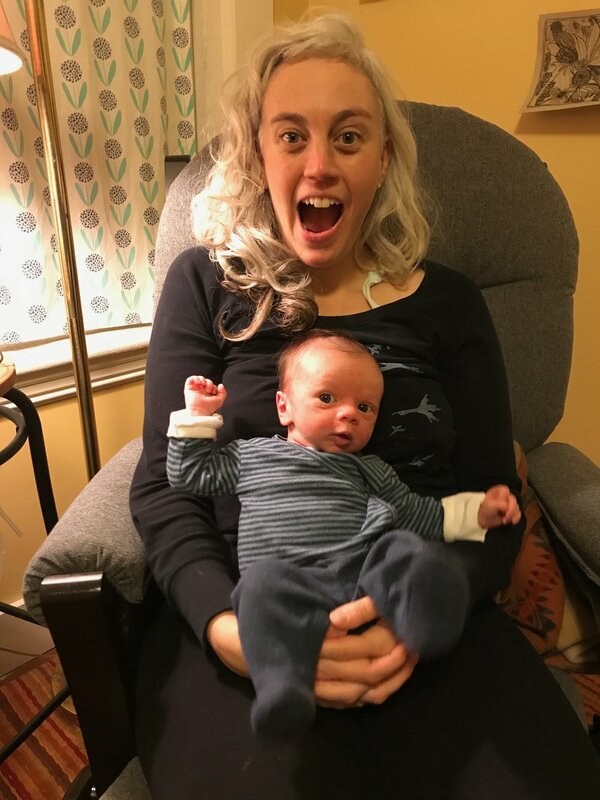 When I ultimately pushed the placenta out, I sobbed and sobbed, filled with such relief that all was fine, anger over my previous births, and joy at my amazing, perfect homebirth. I truly wish I had known in my earlier pregnancies what I learned in my third: that homebirths are safe, beautiful, empowering and truly the way that nature intended for babies to be born. Thank you Audra, Tara, and Catherine!